Atiuans trace their ancestry from Tangaroa, the principal god of Atiu and universally recognised in Polynesia as tutelary god of the sea. The ancient name of the island was Enuamanu, meaning the island of insects and animals, although there is some dispute over whether 'animals' includes 'insects'. The Atiuans understand it as meaning there were no previous inhabitants. The Atiuans call themselves 'worms of Enuamanu' because they were born on Atiu and hope to be buried there. There was once a custom on Atiu similar to that of New Zealand Maori of burying a newborn child's placenta under a newly planted tree. This is the origin of the Atiuan saying: "We come from the land and go back to the land." The Atiuans were a fierce, warrior people and before the arrival of the missionaries busied themselves with making war on their neighbors on Mauke and Mitiaro, slaughtering and eating significant numbers of them. When Ngakaara’s power had waned Ngamaru Povaru was the more dominant of the three kings of Atiu. He was a pacifist and ruled with a kind hand and the people called his rule Te Au Maru. One of the first tasks he did was to build a wall around his tribal settlement (marae). At the northern end of the wall he had three monuments built, each capped in a different fashion. These three monuments were to represent the three kings – Ngamaru Ariki, Rongomatane Ariki and Parua Ariki. He also fashioned himself a 'modern' house built out of melted 'cooked' lime. Labour was provided by Ngati-Teakatauira, the people of his tribe. Beside his house he built a small marae at which he and his nine mataiapos or sub-chiefs conducted meetings. It is also the one and same marae dedicated by the original "Nga-toko-itu" (the 7 titular chieftains) of Atiu for the investiture of the three Ariki whenever there is a need. There are two potential sites pointed out by elders where the traditional marae for investing Ariki titles was located prior to the relocation. One was at the head of the tribal settlement the greater marae of Ngamaru Ariki - called "Te Au-noa". This is found roughly to the east/western end. Today the residence of the island Doctor is found on this site. The other is found towards the ravine behind Ngamaru Ariki's 'palace'. The Taunga Ukarau, the one and only high priest vested with mana in heathen times, has the exclusive right and mana to invoke the "Karakia" the sacred prayer for any such investiture and conduct it only on Ngamaru Ariki's marae. In order of seniority, Ngamaru Ariki retained the 'head of the boar' - signifying the more senior of the 3 Ariki. <ref: Am indigenous to Atiu, a member of the Kopu Ariki(tribe), taught by various Tumu Korero(Atiu Historians/School Teachers) - Upokoina Teiotu, Ngatamariki Manu, Tatuava Tanga, etc. and my father Rakanui. </ref> He did several things that earned the gratefulness of his people. He purchased a piece of land in Tahiti on which the Atiuans could settle. He bought a ship – called Ngamaru – to take copra to Tahiti. During the early days of Christianity when lime was plentiful, four Atiuan kings were buried in tombs. There is no sign to say which king is buried here. The tomb was surrounded by a low fence of slabs of coral from the beach. However, when the kings were entombed, the place became sacred and no one was allowed to enter the fenced area. Trees and bushes were not to be disturbed. Two of the kings were entombed in Mapumai, one in Areora and one in Tengatangi. Atiu's area is about half that of Rarotonga. Atiu is a raised volcanic island surrounded by a reef from which rise 6-metre-high (20-foot) cliffs of fossilized coral (makatea). The makatea cliff forms a one-mile-wide (1.6-kilometre) ring round the island, creating a virtual plateau. Erosion at the innerside of the ring has formed dip of about 30 metres (98 feet) into fertile land, which gradually rises again to a central 70-metre-high (230-foot) flat-topped hill. The low swampy land consists of taro plantations, marshes and a lake, Tiroto. This fertile area also grows bananas, citrus fruits, pawpaws, breadfruit and coconuts. Each of the five villages in Atiu – visitors may not distinguish one from the other – has a meeting house which is very important to them. They are well maintained and the villagers have pride in them. In these houses they conduct village meetings and community functions like welcoming and feeding visitors, selling of products. Educational courses are conducted in these houses and when a big group from overseas visit they could be accommodated in here for the time they are on the island. In common with most islands in the southern group, Atiu has only a small, shallow lagoon. It compensates, however, with many picturesque, sandy beaches. As is usual with the makatea islands of the southern group, the fossilised coral limestone abounds with caves filled with stalactites and stalagmites. Of special interest to tourists are the kopeka caves deep in the makatea, the Atiuan 'jungle'. The Atiu swiftlet or kopeka (Aerodramus sawtelli) nests inside Anatakitaki Cave. The swiftlet navigates in the dark using sonar, like bats. Because the island is free of black rats, it was chosen as a site for reintroduction of Kuhl's lorikeet or the Rimatara lorikeet (Vini kuhlii) in 2007. From the early colonial days when the local population was barred from drinking alcohol, the Tumu Nu came into being. The men carved a barrel from the trunk of the coconut tree and brewed the concoction in there. This would be hidden away near the plantations. As time went by drinking was finally legalised and now the villages each have a place for drinking and socialising. Formerly women were not allowed in these places but this rule has been relaxed and both men and women may be found in these places. There are strict rules of behaviour and anyone causing problems in one place will also be barred from other places. Visitors are very welcome here and all one needs to do is to leave a small donations at departure. The participants sit on home made seats around the barman who is in the centre and in reach of all the participants. The barman has a miniature cup – the bottom part of a tiny coconut – and serves everyone from it – going around the full circle. One may drink or wave away the drink. There is a table with sliced up fruit and one may help oneself. There are generally instruments strumming and everyone joins in the singing. In the early 1970 an airport was built on the plateau close to the villages. Later on however, it was realised that the runway was too short and could not be extended. About 1984 the building of the airport near the beach was undertaken. The work was done by hand voluntarily by the people of the island. The land belongs to a large number of landowners who are supposed to be paid from the landing fees charged but maintenance of the airport and runways depletes this fund and very little get to the land owners. The airfield today is served with small aircraft from Aitutaki and Rarotonga, operated by Air Rarotonga using Embraer EMB 110 Bandeirante aircraft. Flight are approximately 45 minutes. In 2015, the Chinese gave the island several large machines to enable the locals to tar seal the runway. These were one of the earliest houses built by the government. There was one for each village. Inside at either end of the house is a huge concrete tank to contain the rain water collected. In the concrete floor beside each tank is a hollow about one square metre (11 square feet) and about one-half metre (1 foot 8 inches) deep with a tap from the tank at one end. Here is where the villagers are to fill their containers to carry home for the day’s use. Today, every household has been supplied with plastic tanks to catch the rainwater and they no longer need to go to the catchment building. However, in times of water shortage tankers may fill up from here to take to the homes. Before the modern world came to Atiu there was very little rubbish to get rid of that could not decompose, be burnt or eaten by pigs or dogs. Since the arrival of the modern world there are tins, bottles, plastics and many other materials to get rid of. The most convenient placea to get rid of these are hollows and caves. When one hollow is filled there is a move to another hollow. The people are unaware of the harm they are causing to the underground water. Taro roots and taro leaves are the staple food of Atiuans. Every meal is not complete without taro. Each home has two, three, four or more taro patches. There may be as many as ten varieties. The taro is of very good quality and highly sought after by people in Rarotonga, in Aitutaki and in New Zealand. However, the cost of freight is very exorbitant and there is little being sold overseas. When island visitors come to Atiu they delight in being able to go back home with a bag of taro. Because of the large numbers of wild pigs in Atiu, no-one can grow taro or any other crop without fencing. In 2005, the growers of Mapumai were able to get overseas aid to get materials for fencing. Working for one day each week for a whole year the men of the village completed the fence, about 1.6 kilometres (1.0 mile) and surrounding about twelve acres of swamp. This area is now completely pig proof and the men grow taro without worrying about pigs. This is the most taro plants one can see on the island. One other village has fenced their area but the growers are not as plentiful nor as enthusiastic as the growers in Mapumai. Atiu has a long history of growing coffee. Missionaries established it commercially in the early 19th century. By 1865, annual exports of coffee from the Cook Islands amounted to 30,000 pounds. 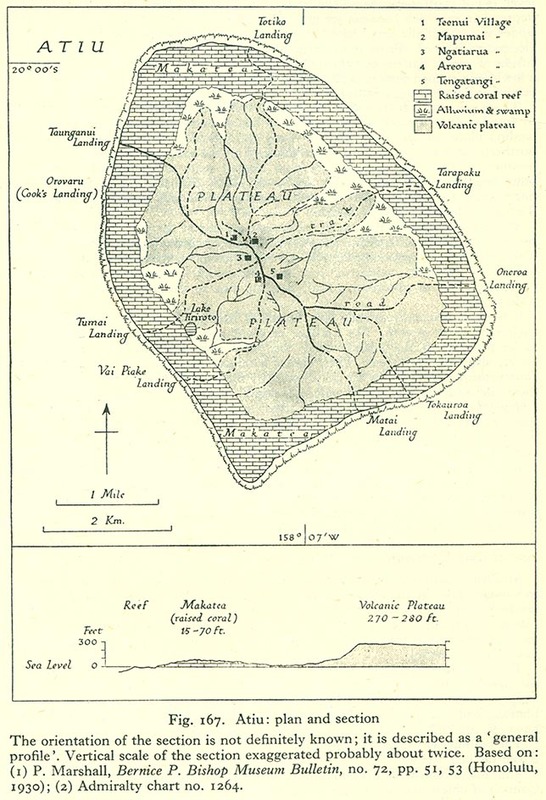 The islands' ariki (high chiefs) controlled the land used for planting and received most of the returns. The commoners often saw little if any reward for their labour. In the late 1890s, Rarotongan coffee production suffered due to a blight that affected the plants. Coffee production declined and had to rely more on crops from the outer islands Atiu, Mauke and Mangaia. World Wars I and II resulted in a further export reduction and eventual standstill. In the 1950s the co-operative movement in the Cook Islands resulted in the re-establishment of coffee as a cash crop. On Atiu, under the supervision of New Zealand Resident Agent Ron Thorby and the Cook Islands Agriculture Department, new coffee plantations were established. The raw coffee was destined for export to New Zealand where it was processed and marketed. By 1983, the coffee industry had collapsed. Government stepped back and left the plantations to their landowners. The poor financial return from selling their coffee to a Rarotongan company for processing had prompted the farmers to stop production except for their own private use. The plantations were overgrown with creepers. Commercial coffee production was revived sometime in 1984, with the founding of Atiu Coffee Factory Ltd. by German economist Juergen Manske-Eimke. As of 2012[update], the Atiu Coffee Factory managed 39 hectares (96 acres) of land and produced 4.5 tonnes of roasted beans. The first organised religion established on Atiu, in 1823, was that of the London Missionary Society. In later years, its name changed to Cook Islands Christian Church. Early missionaries and other visitors to Atiu commented on the prominence of Atiu's first church building, erected soon after embracing Christianity, which could be seen from the sea when approaching the island. Today the CICC is renowned for their strong and harmonious imene tuki, the hymns of their forefathers. Women are still required to wear hats during church service, their dress should cover their shoulders, and they should also not adorn themselves with fresh flowers. Men must not wear shorts. In 1894 Father Bernard Canstanie from Tahiti brought the Catholic faith to the Cook Islands. Soon after, it found its way into the hearts of a number of Atiu people. In 1904 the church as we see it today was built by the Atiu Catholic congregation. The priest's residence was rebuilt with the congregation's own labour and funds raised in a communal effort. Presently, the less than 200 Catholics remaining on Atiu have worked hard at raising funds to renew also their hall. The first Catholic Community Hall started off as a school. Today, Atiu has a resident Catholic priest from the Mission of the Philippines. The Seventh-day Adventist denomination was introduced to Atiu in 1926 by a teacher named Chapman. The first church was built the following year and renovated again in 1959. At the beginning of the new century it was felt that the old church building did not satisfy today's modern needs any more. With funds raised amongst the Atiu Seventh-day Adventist communities on the island and overseas, in a massive communal effort a new church was erected on the old one's premises. Pastors invited from Rarotonga officially opened and blessed the new building on the 28th of December, 2002. ^ a b c d e f g h i j k Evaroa, B. (2015) Atiu Online: Points of Interest. Presentation at the Atiu Online: Developing Destination Content – Digital Enablement workshop, Atiu, 23 October 2015. ^ "Atiu: An Island Community". editorips@usp.ac.fj. 1 January 1984. Retrieved 2 May 2017 – via Google Books. ^ "Atiu Coffee Factory: A Look Back". atiu-gourmet-coffee.com. Archived from the original on 2016-03-03. Retrieved 2 May 2017. ^ Atiu: Coffee revival in the Cook Islands by Jim Eagles, May 3, 2012. Wikivoyage has a travel guide for Atiu. This page was last edited on 4 February 2019, at 10:03 (UTC).